The Bar Fly (front) is a great alternative for mounting a Garmin Computer. 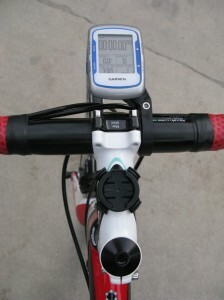 The stock Garmin mount is shown for comparison on the stem. Two years ago, I finally purchased a Garmin bike computer when the Edge 500 was introduced. Tightwad that I am, I had refused to buy the pricier models. Still, at $350, I was surprised at what seemed to be a cheap, flimsy mount. After I figured it out, though, I was satisfied that it was reasonably solid. 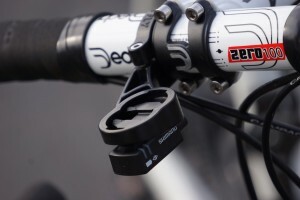 Still, mounting a $350 (or more) Garmin bike computer with, essentially, hardy rubber bands? Come on. So, I was pleased, though not surprised, when I learned of the Bar Fly, an aftermarket mount for Garmin bike computers. I had the opportunity to test one, and I do like it. 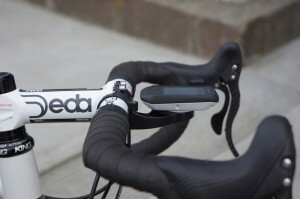 The Bar Fly attaches to the handlebar, and then extends around and in front of the stem. This, of course, is what makes the Bar Fly a great product. No longer is the computer attached to my stem, where I have to strain my eyes further down to see it. I can quickly and easily flick my gaze to the computer when I want to view my data. Nor is it on the handlebar taking up space where I like to place my hands. And it is much better protected in the event of a crash and from other forces that might damage it or knock it off the mount. I have only two criticisms. Well, three actually. First, the straight lines on the mount need to go. Smooth, curving edges are far more pleasing to the eye. A bicycle is mostly curves and smooth edges, not hard, sharp angular lines, and it would be nice if the Bar Fly blended better. Second, the palm of the mount where the computer attaches should be such that the computer sits a little further down. I felt I needed to raise the computer slightly to get the right viewing angle, and that raised the profile more conspicuously above the line of the stem and handlebar. The third criticism? The price tag of $39. This seems rather high for what is, in essence, a piece of plastic. It is, however, a high quality plastic, Delrin. And, so far, the Bar Fly has no competitor. (That, of course, will likely change.) The developer has said it will address this issue somewhat, along with adding an additional but as yet unspecified new feature, with the introduction, prior to Interbike, of the Bar Fly 2.0. Frankly, something closer to $20-25 would be more palatable and likely more marketable. Despite these minor criticisms, the Bar Fly is a great accessory. I won’t be going back to the old mount. Category 4 to HC rating: Category 1 (almost perfect). The Bar Fly 2.0 in action. The Bar Fly 2.0 is Di2 compatible.